But reunions and great reveals provide a great table-setter for rest of final season. Before Sunday night's episode, the last of "Game of Thrones" aired on Aug. 27, 2017. In real time, that's nearly 20 months, but for fans it's 595 days, and for the truly obsessed — who really need to find something better to do with their time — it's 14,280 hours. Well, fans — obsessives and otherwise. Worth the wait? Let's see: Among much else, there was one unforgettable, or easily recalled, line ("You've completely ruined horses for me"), and one unforgettable ride which preceded that. Rhaegal and Drogon continue to be the really big stars of "Game." There were callbacks, and in fact, it's hard to imagine who wasn't called back. Tormund Giantsbane (Kristofer Hivju) — last seen as the Wall was flattened by an undead Viserion — was here as well. He has yet a role to play, a big one. Otherwise, the return of one particular king and one particular queen on Sunday was a muted affair. All perfectly good, and no one died. But muted nonetheless. Obviously gaps of nearly two years require reintroductions but along with that we also got reunions. Jon (Kit Harington) reunited with his half-sisters, Sansa (Sophie Turner) and Arya (Maisie Williams). Theon (Alfie Allen) reunited with his sister, Yara (Gemma Whelan). Reunion and unity and disunity were the broader themes, all foreshadowing as they must that final, gripping closer scene: Jaime Lannister (Nikolaj Coster-Waldau) looking balefully across the courtyard at Winterfell to Bran Stark (Isaac Hempstead Wright). And Bran ... well what did that look communicate exactly? Nothing good, for Jaime anyway. Reunions have happened, but clearly unity will be something much harder to achieve. That was obvious from the outset, when Lyanna Mormont (Bella Ramsey) threw shade at Jon, and everyone else seemed to throw shade at Daenerys (Emilia Clarke). Sunday's eighth and final season launch was more of a fan-pleaser than crowd pleaser — a table setter that offered requisite intrigue (what does Cersei, played by Lena Headey, have up her royal sleeve), and Samwell Tarley (John Bradley) too. The great reveal that has driven the entire series — that Jon in fact is Aegon Targaryen, rightful heir to the Iron Throne — arrived almost as more of a shrug, and a long-anticipated one too. The more gripping one preceded, when Sam learned that Dany had ordered the execution of his father and brother. Once a friend and ally to all, Sam is now a wild-card — and possibly an enemy, too. Dany's fate seems even further complicated by Sansa's ice-cold reception, as well. What, oh what, is going to befall the mother of dragons? Meanwhile, the dead march on, and they leave their usual calling cards — cadavers, body parts and dead children, arrayed in artistic swirling patterns, signifying ... what? We'll surely find out. So yes — absolutely — well worth the wait. 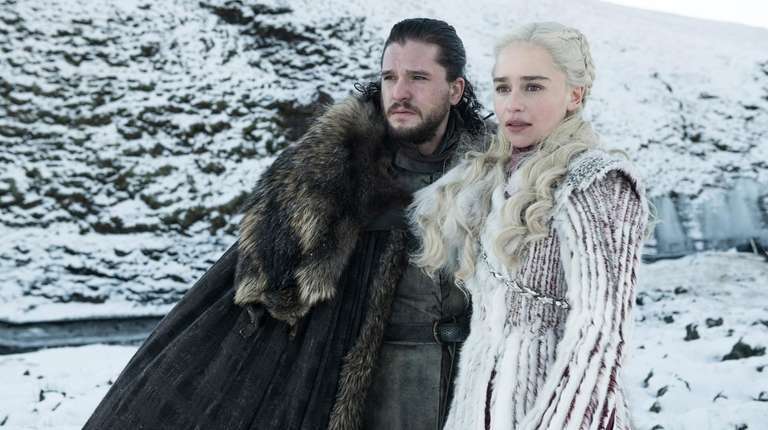 "Game of Thrones" is back, along with its many pleasures, intrigues and characters. How could it not be? 9 ways to celebrate the return of 'Game of Thrones'Welcome back the world of Westeros with other serious fans. New York 'GoT' fans prove their loyalty to the throne Keen devotees of the TV series display how it has been life-altering, using "GoT" themes, costumes and crafts in their careers, major life moments and more. Quiz: Who said these 'Game of Thrones' quotes?You know nothing.